Arizzi is an Italian foundry located in Albino. The company casts a large number of different products, from gear boxes, engine blocks and transmission parts to hydraulic pumps, textile machinery and valves. In 2007 Arizzi implemented NovaCast’s metallurgical analysis tool ATAS MetStar, and in 2011 they also implemented NovaCast’s tools for design and simulation, enabling a much faster process, higher accuracy and improved quality. Paolo Salvi, the head designer at Arizzi, is using the design software NovaMethod to create and edit the 3D models for both the final details and the design of the complete gating system, including flask and feeders, core boxes etc. In NovaMethod he can easily re-use data and models and create cores. An important benefit is the compatibility with other design software, when importing and using customers’ drawings. Paolo Salvi also uses the simulation system NovaFlow&Solid to simulate mold filling and solidification, and detect possible problems like cold-flows or shrinkage. For a foundry like Arizzi, the speed is crucial to be able to make many simulations in a short time, and to fine-tune and verify the design before it goes into production. While Paolo works in the technical department, his colleague Antonio Pizio is the company’s metallurgist, using ATAS MetStar daily for the thermal analysis of the melts. Antonio appreciates the fast and easy-to-use features, together with the database. ATAS MetStar can be used in many different ways, from a basic level of thermal analysis of the melts, to the most advanced level when you use the data to fine-tune and optimize the process and the best practice to obtain a stable quality with very little variation. Antonio also appreciates the service and contact with NovaCast, and the annual meetings where users can compare and share experiences and results with each other to learn more. The challenge ahead is to improve the possibility to use the thermal analysis data from ATAS MetStar in the simulation process. This will make the simulation even more accurate, since the liquid quality is the final key to getting a perfect result in the end. At Arizzi, Paolo and Antonio work together with NovaCast to develop the data connection between MetStar and the simulation system. The shrinkage prediction in NovaFlow&Solid is giving you answers if the part will be sound or have defects. Even if you get shrinkages, it might not be problematic as long as they don’t jeopardize the functionality of the part. 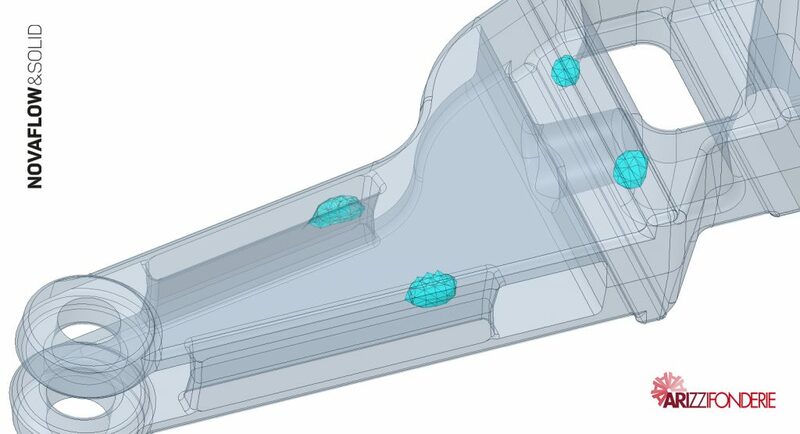 NovaFlow&Solid has a particular function where you can export the shrinkages as solid objects which then can be used in combination with the machined 3D model or during stress calculation when applying functional loads to the part. By using the function called Flow Color, you can simulate how a gating system fills the part more detailed. It means that you apply a specific color to a certain ingate and then you will see how much that ingate fills of the part. This can be seen both in color but also in % and weight. The temperature distribution shows the cooling down of the metal and how much temperature loss you get during the filling. In this particular case the temperature loss is not critical, but if it would be you can get unfilled part because melt solidifying before it has completely filled the mold.